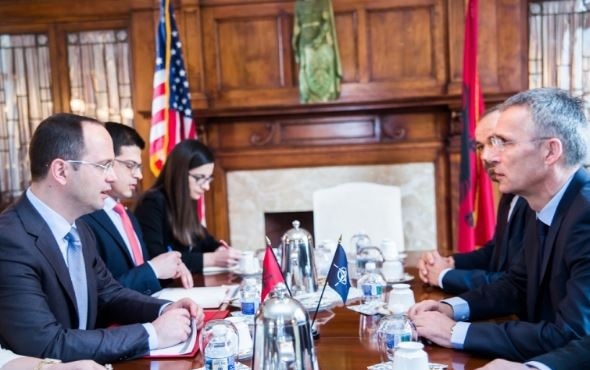 Foreign Minister Ditmir Bushati held a meeting yesterday with NATO General Secretary, Jens Stoltenberg, at the premises of the Albanian Embassy in Washington DC. The conversation was focused on Albania's contributions within the Alliance, in response to the challenges on the Eastern and south side, the security situation in the region, as well as coordination of the member countries' attitudes on the eve of the upcoming Ministerial of NATO on April. Minister Bushati reiterated the steps taken by Albania towards meeting the commitments of the Warsaw Summit, including the budget and increase defense spending. Secretary Stoltenberg praised Albania's role in maintaining peace and stability in the region, the contribution to our country in NATO operations and missions, as well as in the fight against terrorism and violent extremism. An important part of the discussions were the latest developments in the region, including Kosovo-Serbia relations, the current situation in Macedonia and the outcome of Montenegro's NATO accession process. The interlocutors dwelt on the need for concerted efforts to consolidate democratic stability and improve the security environment in the region, in response to the destabilizing factors in the Western Balkans. In this context, Minister Bushati stressed the need to deepen cooperation between the Alliance and the region, and especially the institutionalization of NATO relations with Kosovo, as a way to address the legitimate demands for more security. In the framework of the Communication of Warsaw, the commitment of NATO becomes even more necessary after the recent events destabilizing the peace and the path of Euro-Atlantic region. The parties agreed that the progress of state-konsiliduese reforms, in collaboration with international partners and Euro-Atlantic perspectives remain the main axes of strengthening peace and democratic stability in our region, with respect to Euro-Atlantic values.